Anybody who's a regular on the social scene has made an appearance or four at the Hilton Anatole. They host some of this town's biggest galas throughout the year. But you are about to discover that there is a lot more to this property than just the Nana Grill and the Chantilly Ballroom. This exclusive event will be hosted by four VIP celebrity bloggers: Lisa Petty of DFW Style Daily, Raya Ramsey of D Magazine, Erica Nicole of YFS Magazine... and ME! Cynthia Smoot of Oh So Cynthia! Broadcasted live from five 60-inch flat screen TVs, Twitter and Facebook feeds will allow guests, VIP hosts, Red Bull and Deep Eddy Vodka to Tweet and gossip in real-time through Social Media Delivered. Using the twitter hashtag #GossipBar, hundreds of Dallas socialites in attendance will be competing to drive social media trends from inside of this exclusive Gossip Bar event as they Tweet, mention and post photos about the “Bottles, Bling, and Blogs” event. To keep the crowd bumping, a live DJ, percussionist, and saxophone player provided by Red Bull will provide beats on the ones and twos. Refreshing Red Bull and vodka cocktails, made with Deep Eddy’s premiere vodka, Savvy, will be served to VIP guests as they enjoy a round of delicious light appetizers, provided by the Hilton Anatole’s Media Grill + Bar. Deep Eddy Sweet Tea Vodka will also be provided for complimentary tastings for other guests, as well as various Deep Eddy drink specials, during the event. This exciting, interactive social media-driven event will be something Dallas socialites won’t want to miss! Equipped with live music from Red Bull, celebrity hosts, Deep Eddy vodka and Red Bull cocktails, designer jewelry pieces and live Twitter and Facebook feeds projected from 60-inch screens, the “Bottle, Bling, and Blogs” event will introduce the luxurious Hilton Anatole’s Gossip Bar as the newest, chicest bottle service bar in Dallas. RSVPs are highly encouraged by visiting our Eventbrite page http://bottlesblingandblogs.eventbrite.com/. Complimentary valet parking at the Tower Entrance. 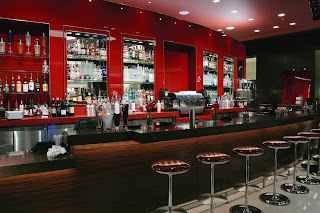 The chic new Gossip Bar at the Hilton Anatole is immersed in contemporary style and rich red hues. It serves as the perfect mix of color and commentary. 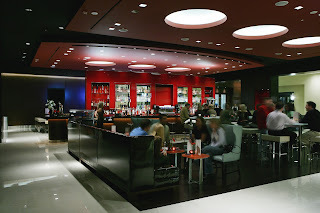 Boasting five 60-inch flat screen TVs and signature martinis and premium cocktails, the Gossip Bar is the perfect place to “plug-in” to the electric energy of Dallas’ new hot spot. Located within a 45-acre campus, the Hilton Anatole Hotel features two high-rise atriums; a 27-story tower; and 1,606 luxuriously appointed guestrooms with first-class in-room amenities and wired Internet access. Additionally, the hotel offers guests more than 600,000 sq. ft. of event space as well as a variety of recreational activities, including viewing the Art Collection, one of the largest and most intriguing private assemblies in the world; an 80,000 sq. ft. fitness center, tennis courts, one of the finest lap pools in the region, an indoor jogging track; gift and sundry boutiques; V Spa, the hotel’s newest luxury spa oasis; and eight unique restaurants and bars for dining and entertainment, including the new high-tech Media Grill + Bar, award-winning five-star Nana and chic Gossip Bar.